Learn about central banks and why they are so important to both markets and traders alike. A central bank is a national bank that provides financial and banking services for its country’s government and commercial banking system. It also issues the country’s currency; according to the European Central Bank, “a central bank is a public institution that manages the currency of a country or group of countries and controls the money supply – literally, the amount of money in circulation. The main objective of many central banks is price stability. In some countries, central banks are also required by law to act in support of full employment”. It’s also worth remembering that a central bank is not a commercial bank. An individual cannot open an account at a central bank or ask it for a loan and, as a public body, it is not motivated by profit. Why are central banks so important? One thing should always be remembered - central banks are crucial not only for market participants, but also for the whole economy. They are responsible for price stability, and can also support economic growth or employment. As for the financial markets, the most important thing to remember as a trader is that central banks control the money supply. In turn, this means that a central bank’s monetary policy or implementation of its fiscal policy can have effects on the direction of the forex market. One of the main tools of any central bank is setting interest rates - also known as the cost of money. As the central bank changes its rates, it influences the interest rates market, but also the foreign exchange market. Let’s take a look at an example. Imagine that the Federal Reserve sees that the economy is performing well, unemployment rate is satisfactorily low, economic growth is solid and inflation is on the rise. In such a scenario, the Fed would likely act to raise interest rates to prevent prices from rising too much. As rates go higher loans become more expensive, so less individuals and companies are interested in taking them. This will then slow growth. But how does this affect a currency? While higher rates make loans or credit more expensive, deposits will generate more interest so traders could look to purchase the currency for a higher rate of return. This leads to higher demand for the dollar, thus making the currency more expensive. 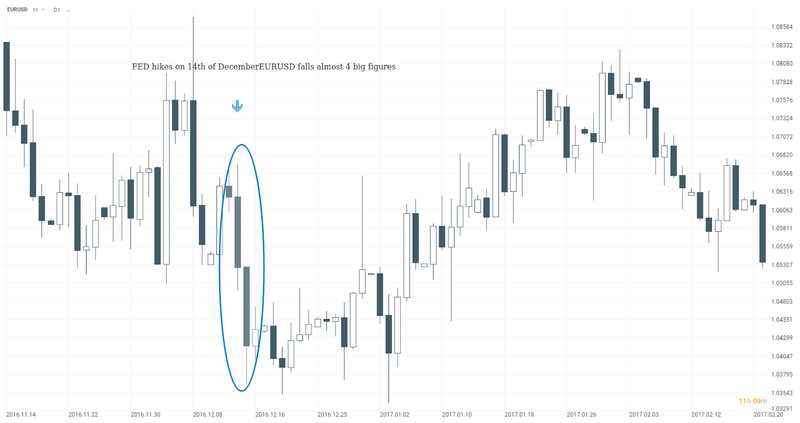 Take a look below how the EURUSD reacted on the Fed’s monetary policy decision in December 2016. It’s important to remember however that interest rates are not the only tool that can be used by central banks. Central banking has evolved and many extraordinary measures were introduced after the financial crisis of 2008/9. A central bank could buy government bonds or lend private institutions money needed to spur credit growth. What’s more, it could also buy other assets from banks to prevent them from going bankrupt. The Fed made these moves after the crisis and this spurred the beginning of the multi-year bull market on Wall Street. As you can see, central banks are the most important market participants that could set the trend of the market. However, some institutions are more influential than others. Let’s find out which central banks are crucial to watch. There are four central banks whose decisions could have a significant impact on the financial markets. Federal Reserve - The Federal Reserve is the central bank of the United States of America. The Federal Open Market Committee is responsible for open market operations which are crucial for the financial markets. The FOMC holds eight regularly scheduled meetings per year. At these meetings, the Committee reviews economic and financial conditions, determines the appropriate stance of monetary policy, and assesses the risks to its long-run goals of price stability and sustainable economic growth. The FOMC meets twice a quarter, and the last meeting during each quarter is accompanied by a press conference and FOMC’s economic projections. The Fed is currently run by Chair Janet Yellen, whose speeches could have a similar impact to an interest rate hike or a cut. Nevertheless, it’s worth listening to other members of the policy-setting committee as FOMC’s decisions are based on the consensus that is created among its members. European Central Bank - The European Central Bank (ECB) is the central bank of the European Monetary Union. It is the central bank of the 19 European Union countries which have adopted the euro. The ECB’s main task is to maintain price stability in the eurozone and so preserve the purchasing power of the single currency. The Governing Council is the main decision-making body of the ECB. It consists of 6 board members and the governors of the national central banks of the 19 euro countries. The Governing Council meets to discuss the monetary policy every six weeks. Each meeting is followed by the Chair’s press conference. The Bank is currently governed by Mario Draghi, who is famous for ending the eurocrisis with his statement that the “ECB will do whatever it takes to protect the euro”. 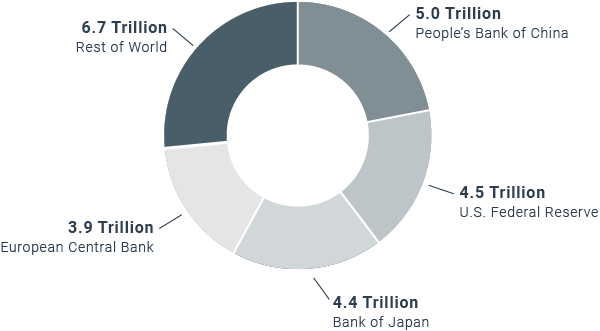 Bank of Japan - As it name suggests, the Bank Of Japan (BoJ) is the central bank of Japan. The BoJ’s main task is to maintain price stability, but it’s important to note that since the 90s, Japanese economy has been struggling. Its growth rate is close to zero, while inflation remains capped and sometimes turns into deflation. That is why the Bank of Japan has introduced the most extraordinary measures among central banks, including negative interest rates. Bank of Japan members meet 8 times a year to decide on the direction of the monetary policy. The governor of the central bank is Haruhiko Kuroda, who appears at the press conference after each monetary policy decision. Bank of England - Despite what the name suggests, the Bank of England (BoE) is the central bank of the whole United Kingdom, not just England. Its main objective is to maintain price stability, but after the Brexit vote, the BoE modified its stance also to support economic growth. Although it’s not a formal rule, the Bank of England has underlined that it will support the economy during the period of Brexit. Monetary policy decisions are conducted by the Monetary Policy Committee that meets eight times a year. The technical aspect of BoE’s decisions is similar to the Fed’s - the governor participates in press conference after only four decisions. However, one difference should be noted. The Bank of England publishes minutes from its latest meeting (a document that describes a discussion that has taken its place on the meeting - it provides an additional insight on the monetary policy direction) along with a decision. The Federal Reserve publishes its document three weeks after the meeting takes place. The BoE is currently governed by Mark Carney, who will step down as the process of Brexit is completed. Different people have different opinions, so it’s not a big surprise that policymakers could have a different view on the economy as well as on monetary policy. Among central bankers we could single out two groups - hawks and doves. Hawks - Hawks are policymakers that focus on keeping inflation low as their top priority. Such bankers prefer higher interest rates and more prudent monetary policy in order to keep inflation in check. They are also less worried on the overall state of the economy. 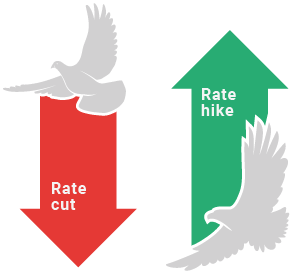 Doves - Doves are policymakers that could tolerate higher inflation in order to boost economic growth and to support employment. Such policymakers prefer lower interest rates. As you can see, there are two ways to describe a central bank’s stance on monetary policy. If you hear that a central bank is hawkish, that means that it wants to raise interest rates or has a bullish view on the economy. For example, a hawkish Fed would signal an interest rate hike, thus leading to a stronger dollar. On the other hand, a dovish central bank would usually have a negative impact on the currency as it won’t be in rush to tighten its policy. As you can see, central banks could be described as the most powerful market participants. Their decisions - or even a single statement from one of its policymakers - could have a significant impact not only on currencies, but also on stocks and bond markets. That is why a prudent trader should closely monitor everything that is connected with monetary policy decisions and central bank decisions. This article is provided for general information and educational purposes only. Any opinions, analyses, prices or other content does not constitute investment advice or recommendation. Any research has not been prepared in accordance with legal requirements required to promote the independence of investment research and as such is considered to be a marketing communication. XTB will accept no liability for any loss or damage, including without limitation to, any loss of profit, which may arise directly or indirectly for use of or reliance on such information. Please be aware that information and research based on historical data or performance does not guarantee future performance or results.